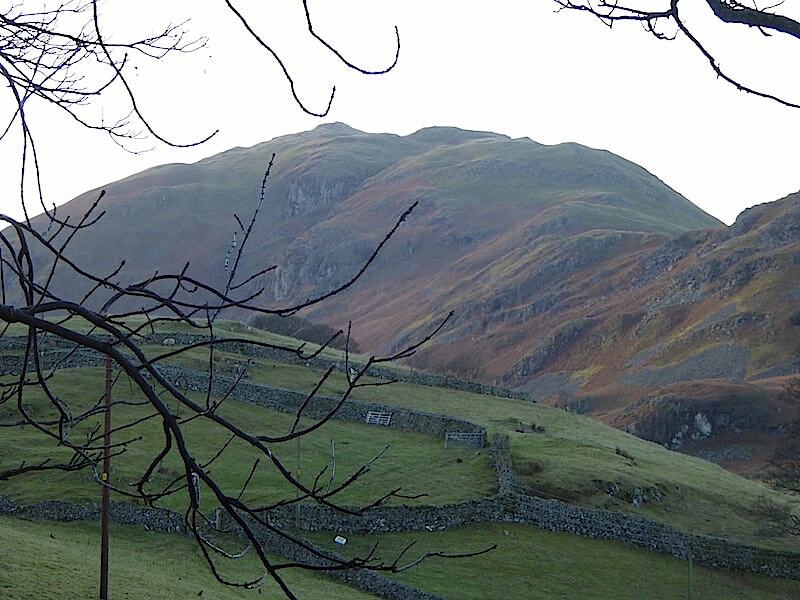 Beda Fell from the parking area by St Peter’s Church, Martindale. It was a bit on the chilly side standing here in the shade. 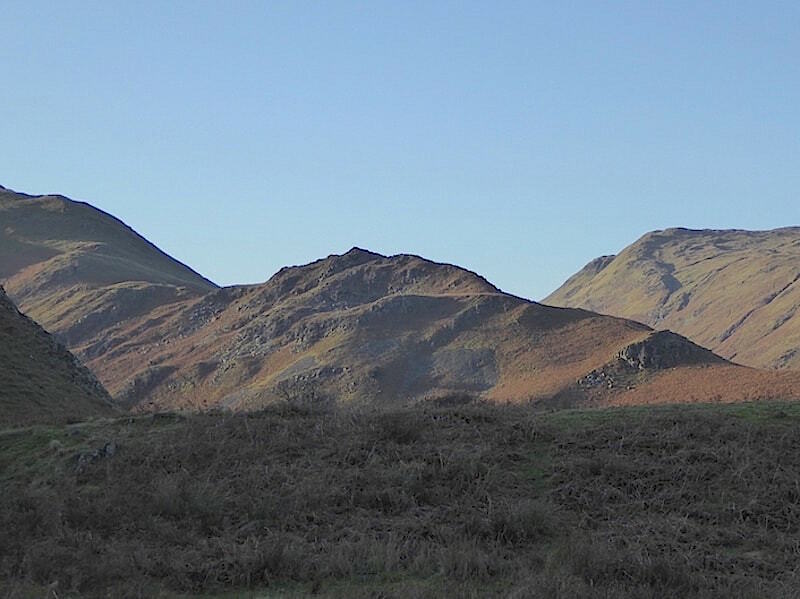 Place Fell beyond Beda Fell, also taken from the parking area. 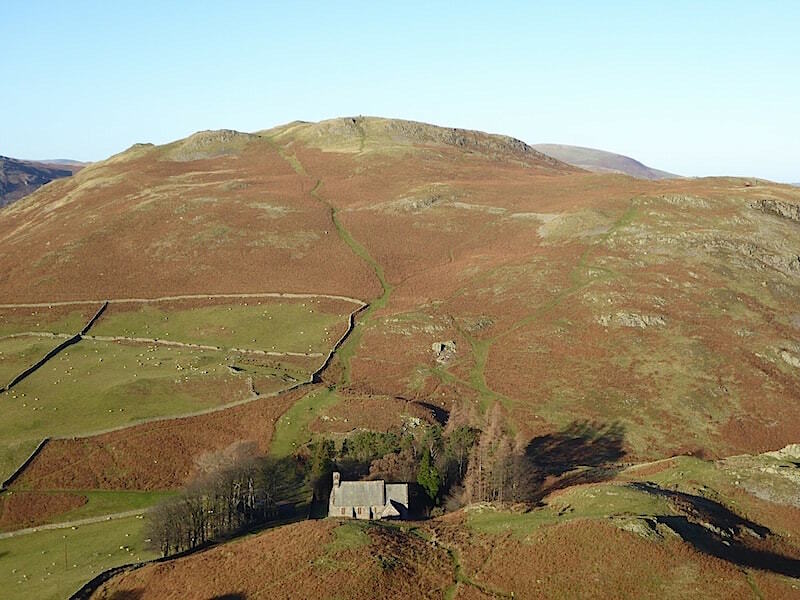 From the church we take the path across the lower north facing slopes of Steel Knotts, this leads us around Steel End and into Fusedale. 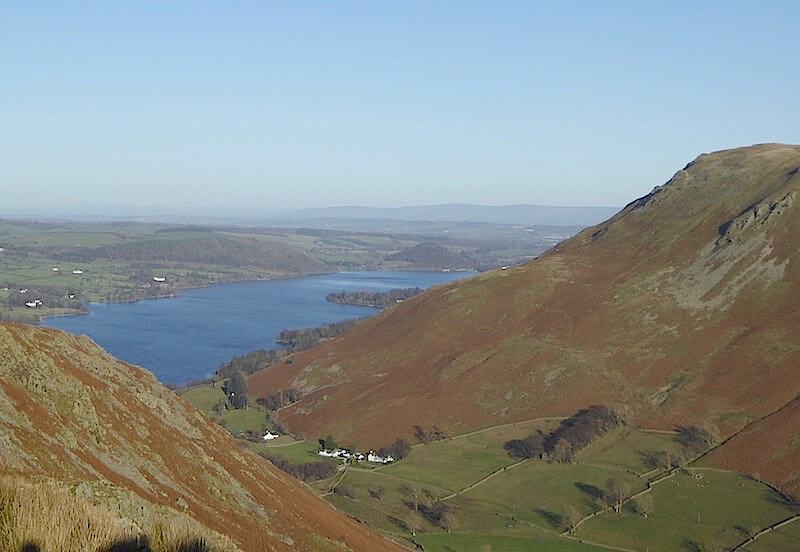 From the path there is this view of the northern end of Ullswater. 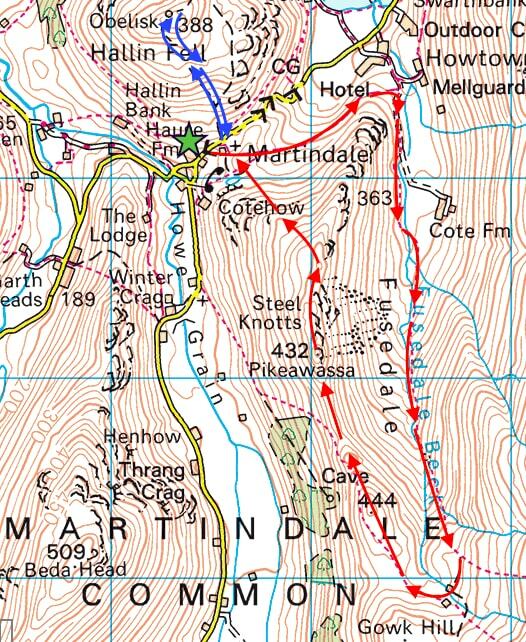 We’re in the shade at this point and will be for most of the walk through Fusedale. 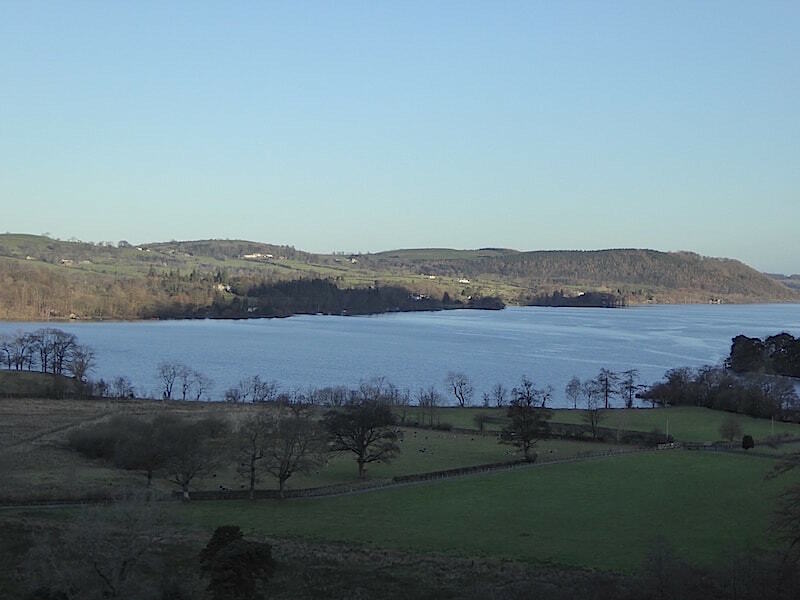 A view of Ullswater from the Howtown end. 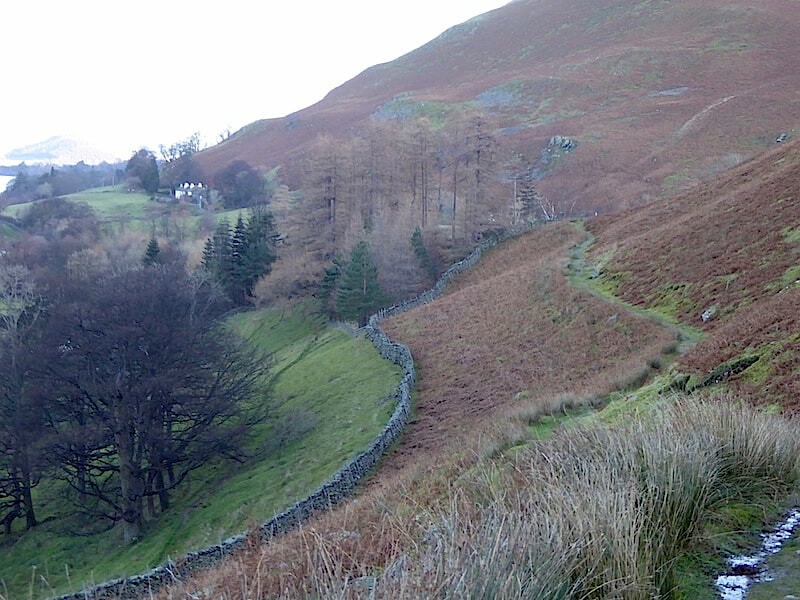 The path we are following along the lower slopes of Steel Knotts which will lead us round into Fusedale. 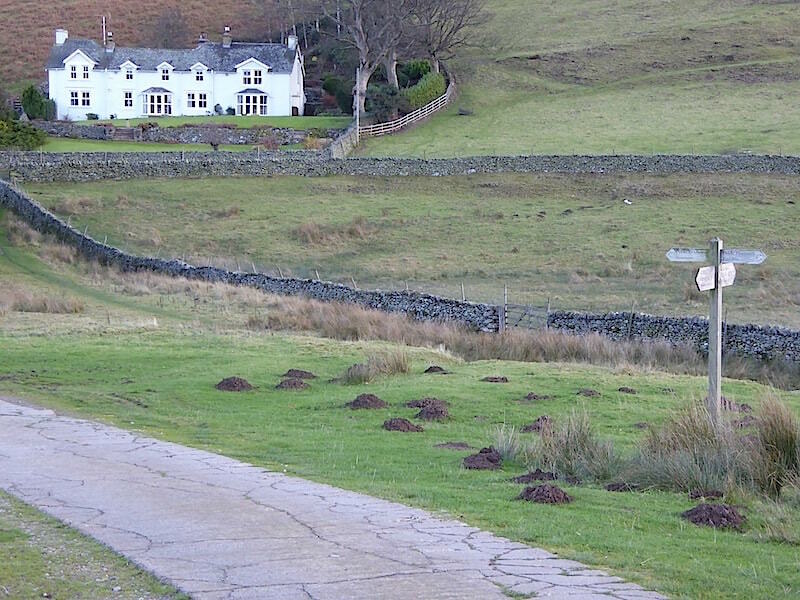 This is the start of the path into Fusedale, looks like a ‘little gentleman in a black velvet waistcoat’ has been very busy over there on the grass. The house opposite is Mellguards. 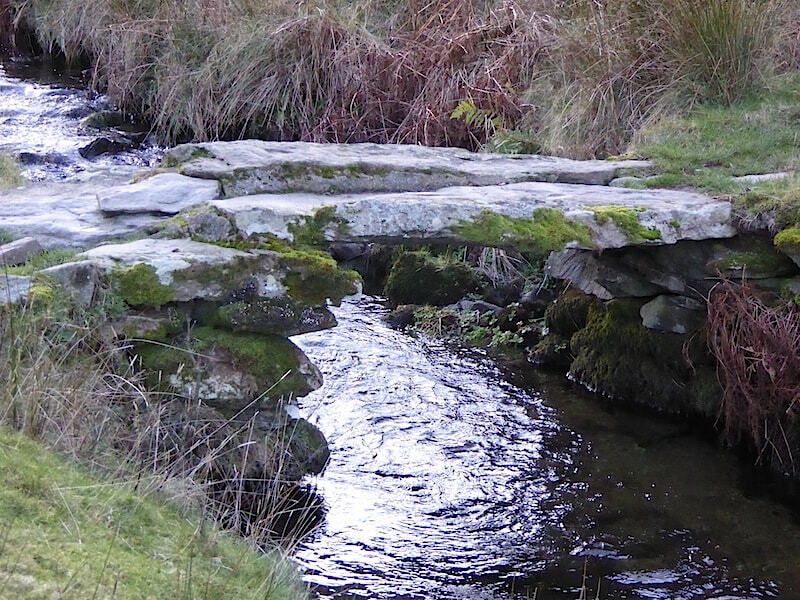 A clapper bridge across the beck in Fusedale …..
….. and a view of it from the other side. 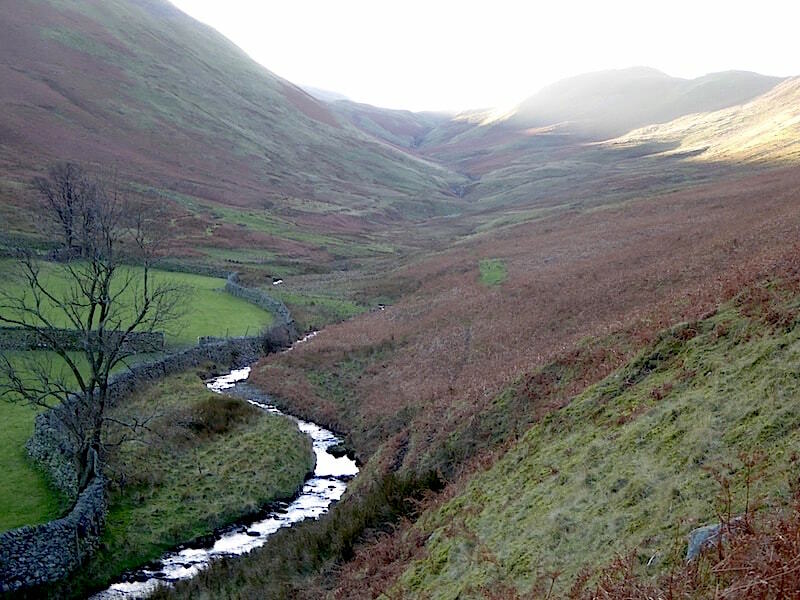 The view along Fusedale, we’ll have to be almost at the top before we reach the sunshine. 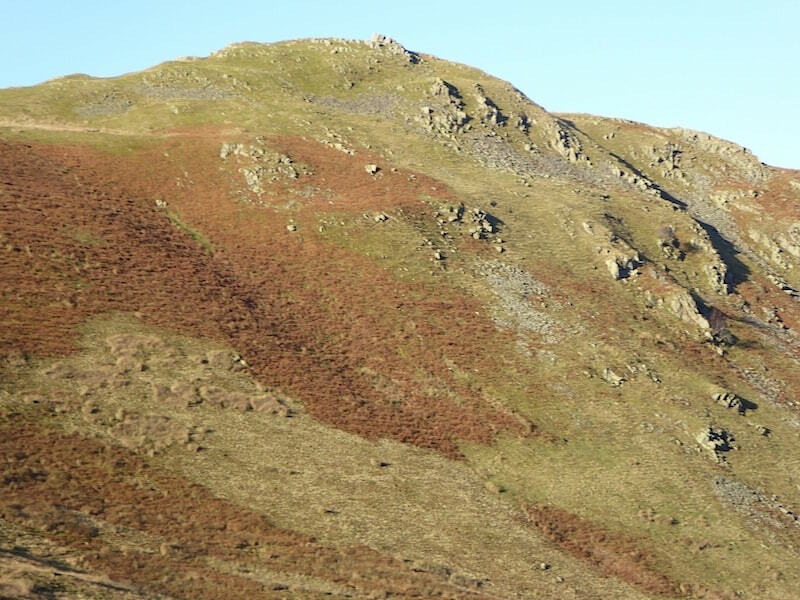 On our right are the east facing slopes of Steel Knotts, we’ll be up there a bit later on. 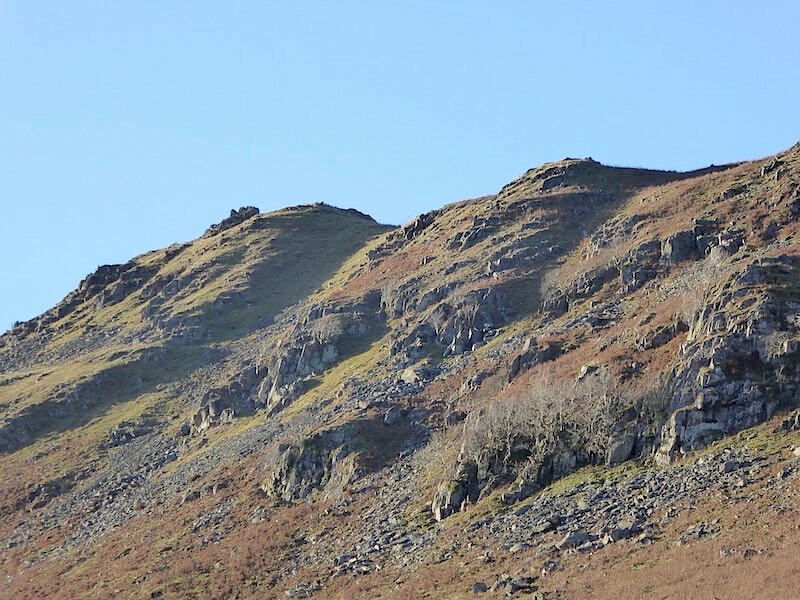 There is a more straightforward route up to the summit but we haven’t walked up to it via Fusedale so we thought we’d give it a try today. 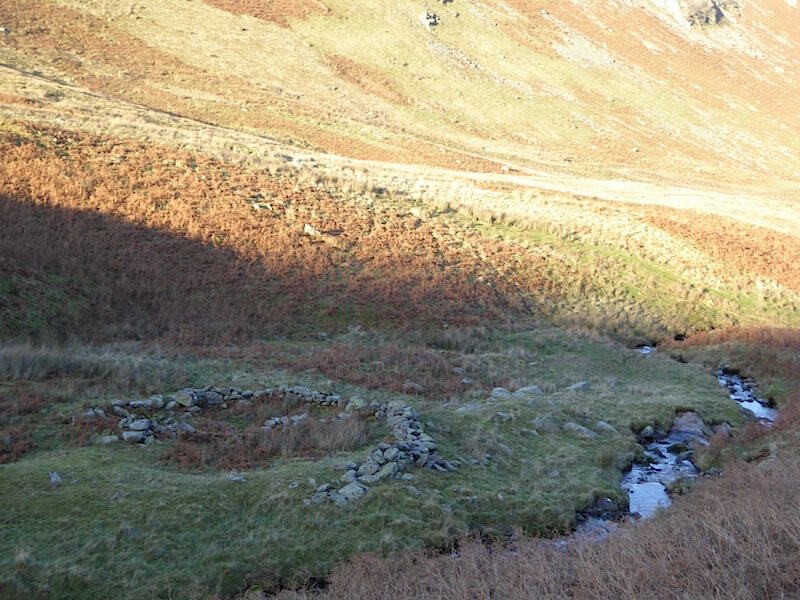 A derelict sheepfold alongside Fusedale beck. 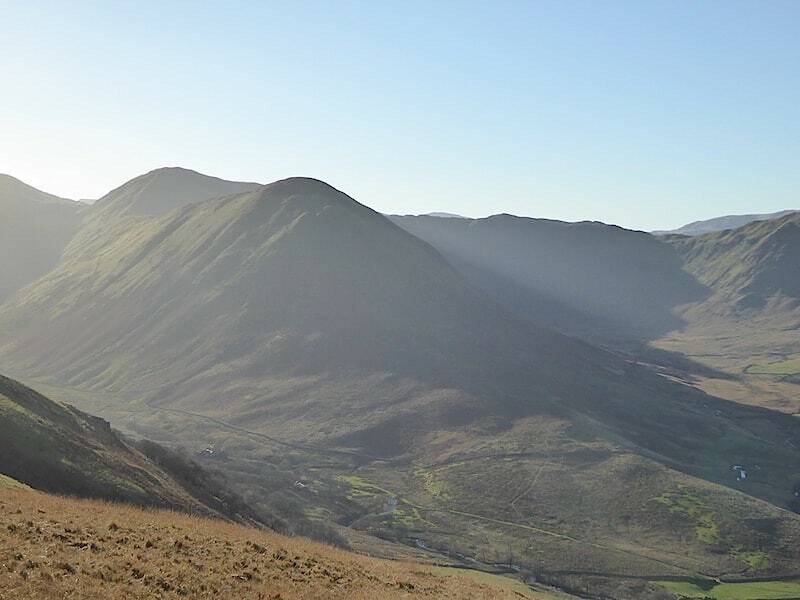 Steel Knotts in full sun across the valley. 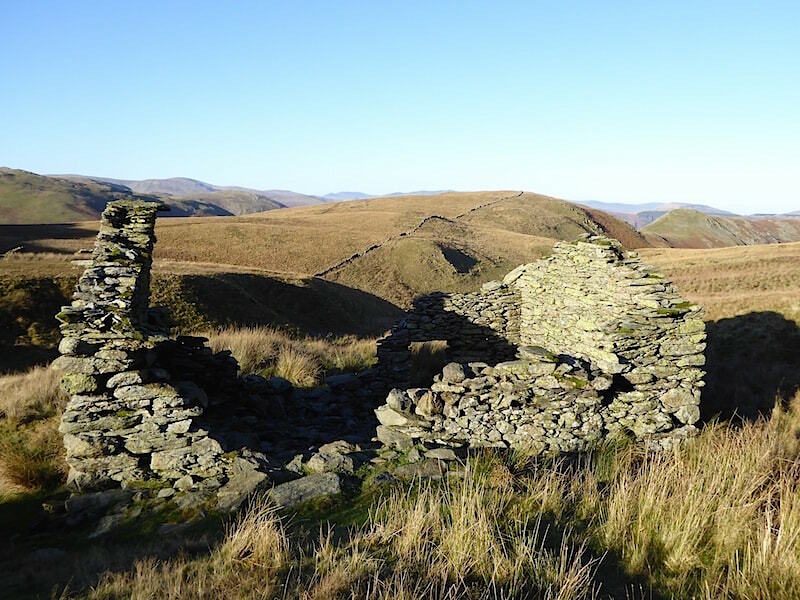 Derelict building on the shady side of Fusedale, which came in handy for a short stop. 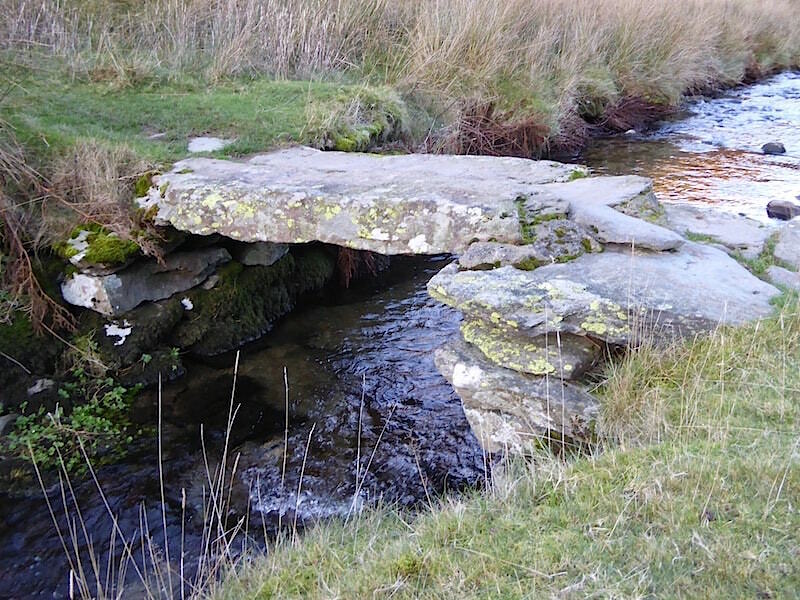 I suppose its safe enough but it doesn’t look like the best place to sit, especially when someone has provided a bench. Then again if you were sitting on the bench and the wall collapsed you might wish you hadn’t. 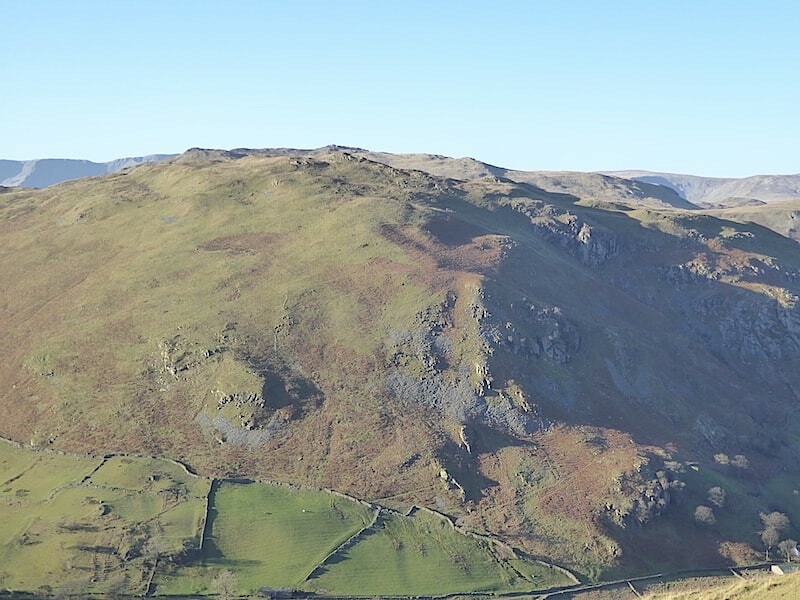 Looking back across Fusedale to Steel Knotts. Watching where you were putting your feet was tricky as we walked across here. We’d reached the sunshine at last but it was low in the sky and directly in front of us, sunglasses didn’t seem to help much either. 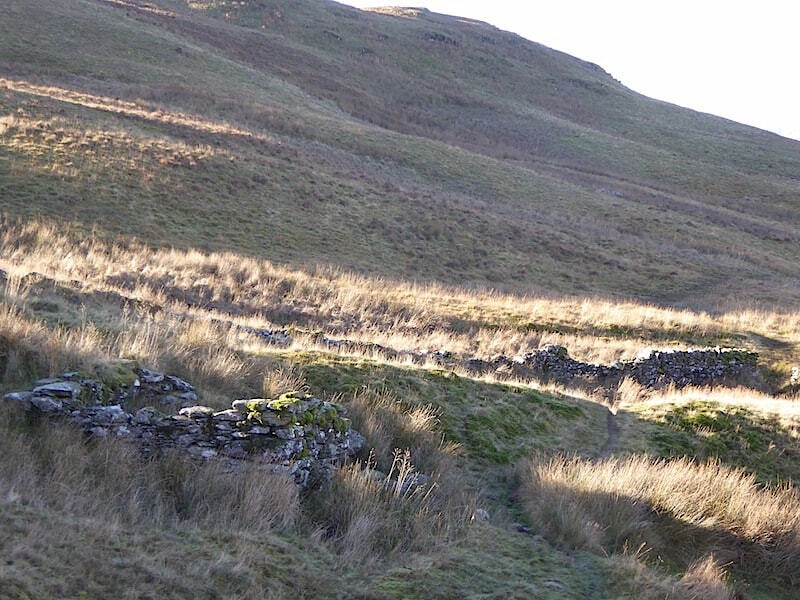 One of the derelict buildings at the beck crossing point. 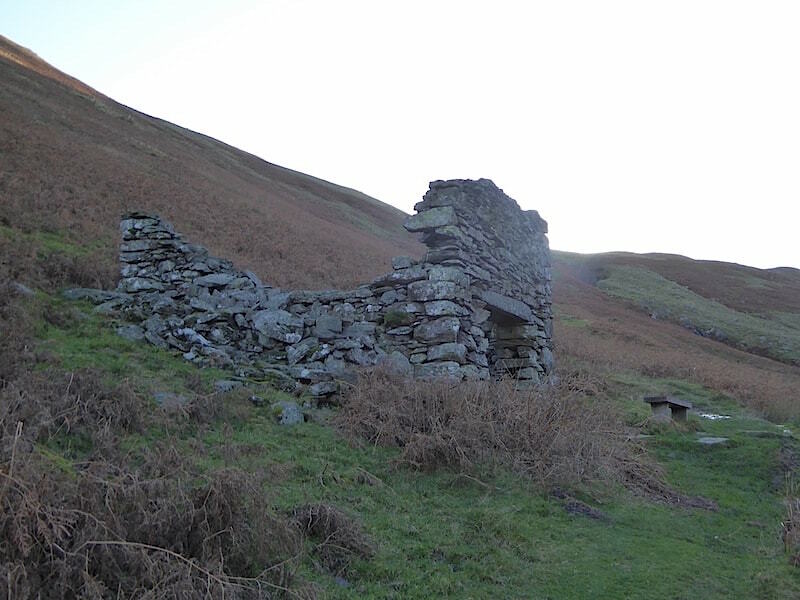 The second derelict building on the other side of the beck. 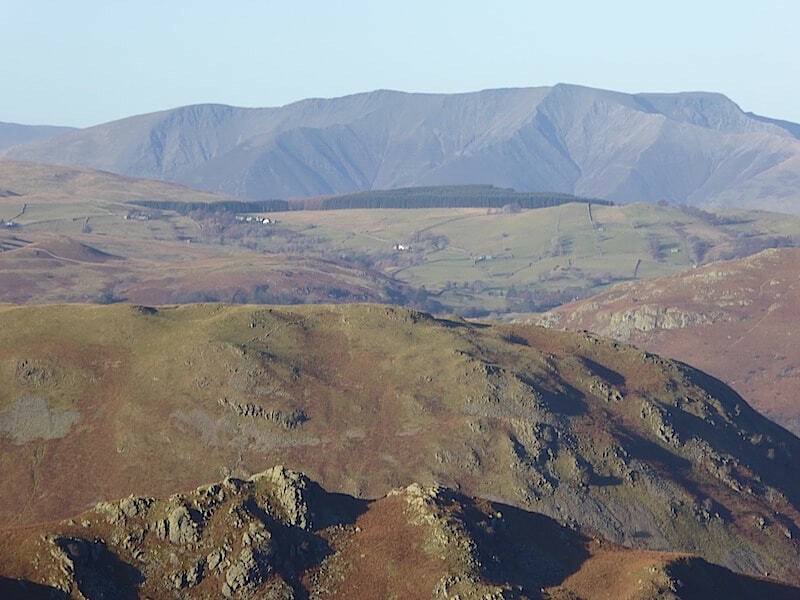 A close up across Beda Fell of Saint Sunday Crag on the right, and Fairfield on the left. I tried to get a good shot of The Nab, but it was difficult to photograph anything to the south as the sun was so strong. 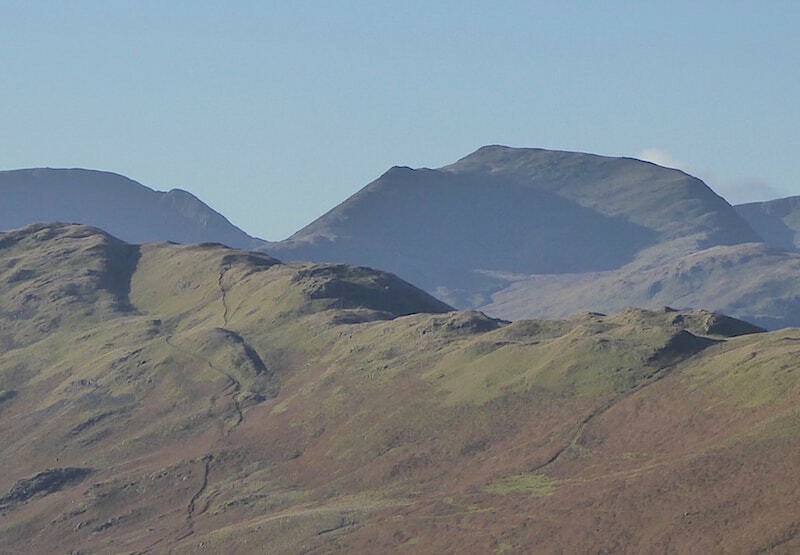 A close up of Blencathra and not a cloud in the sky. 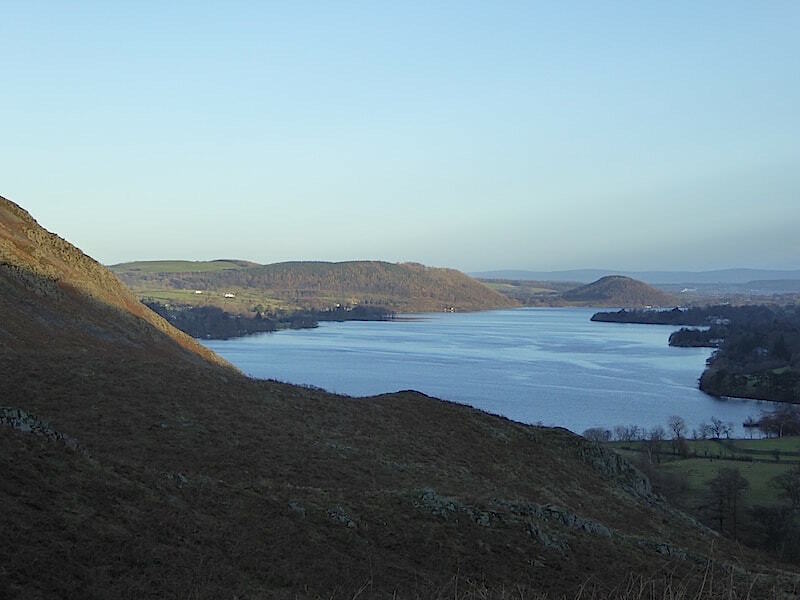 A glimpse of Ullswater with Gowbarrow alongside it, and the northern fells in the distance. 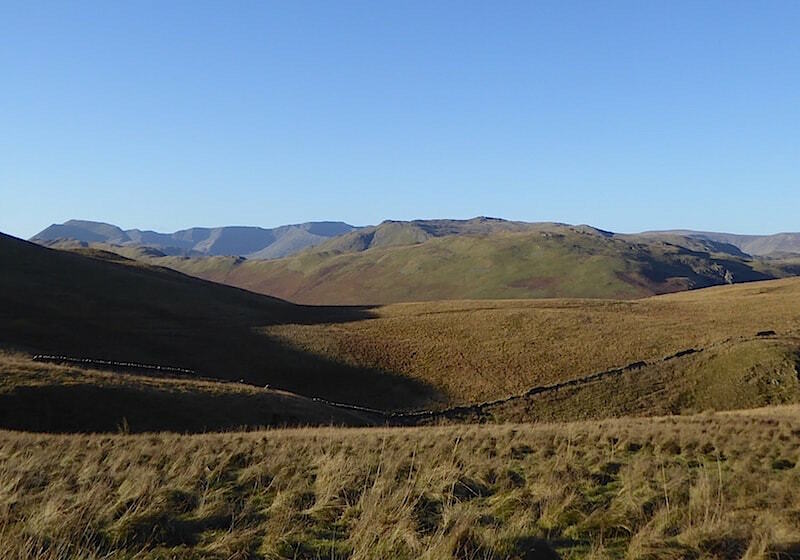 Looking ahead to Steel Knotts. 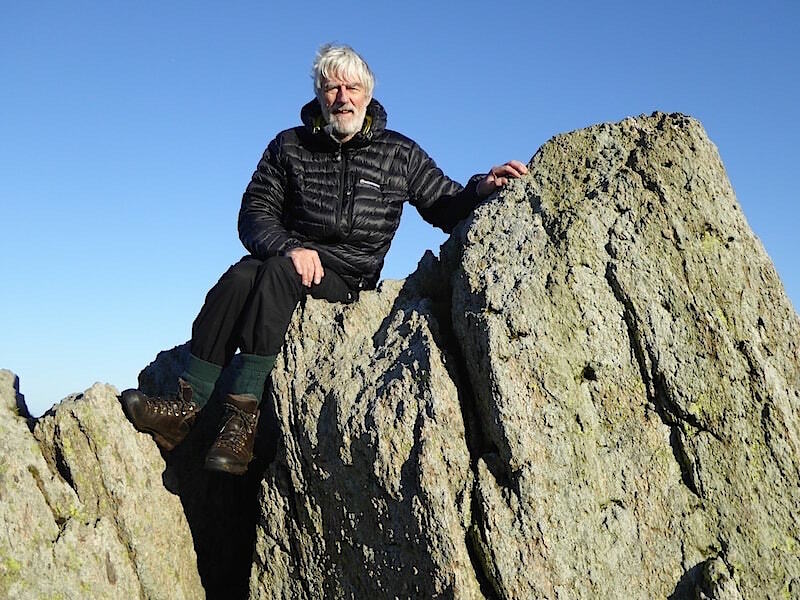 We now had the sun on our backs which was lovely, but we also had a keen north easterly wind in our faces which wasn’t. Get the tissues ready for the eye and nose wiping then. 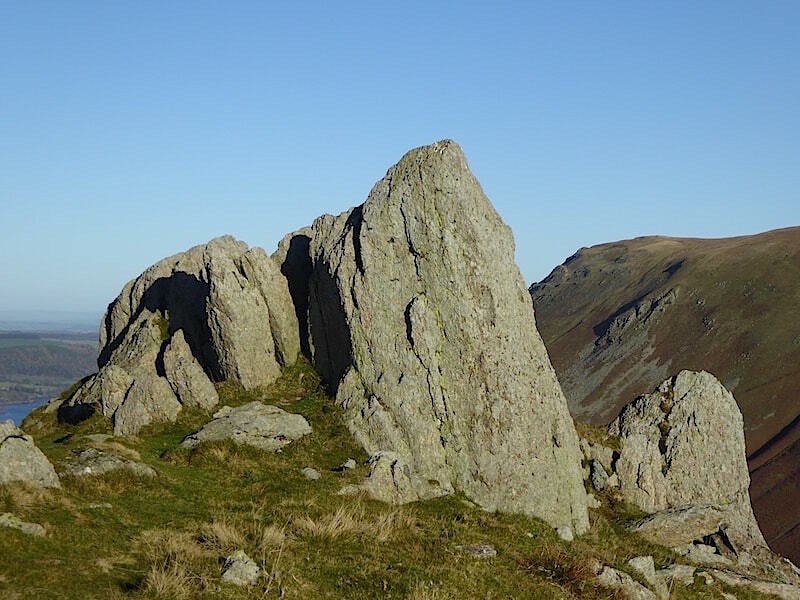 The summit of Steel Knotts with the unusual name of Pikeawassa. Of course, because its there it has to be climbed. 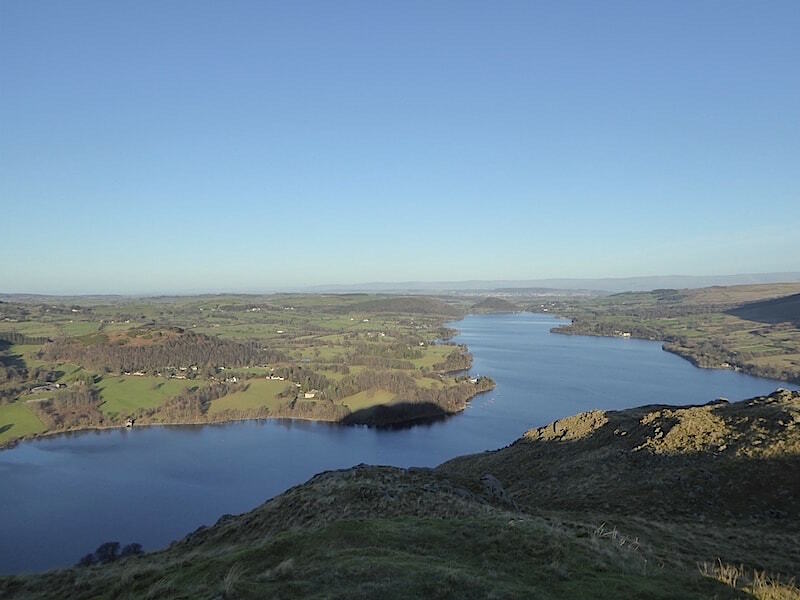 From Pikeawassa a look along Ullswater with Bonscale Pike on the right. 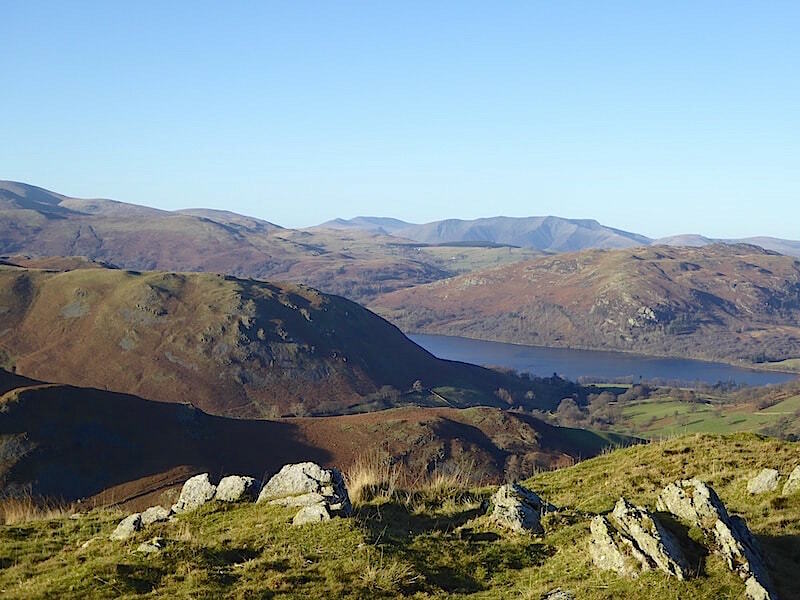 Still on the summit of Steel Knotts and looking over Ullswater towards the northern fells. 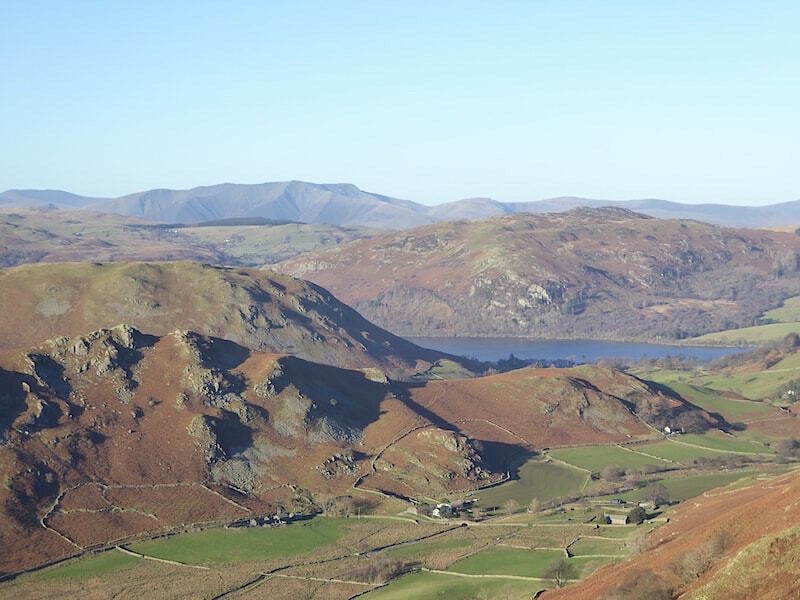 The northern end of Ullswater from Birkie Knott. 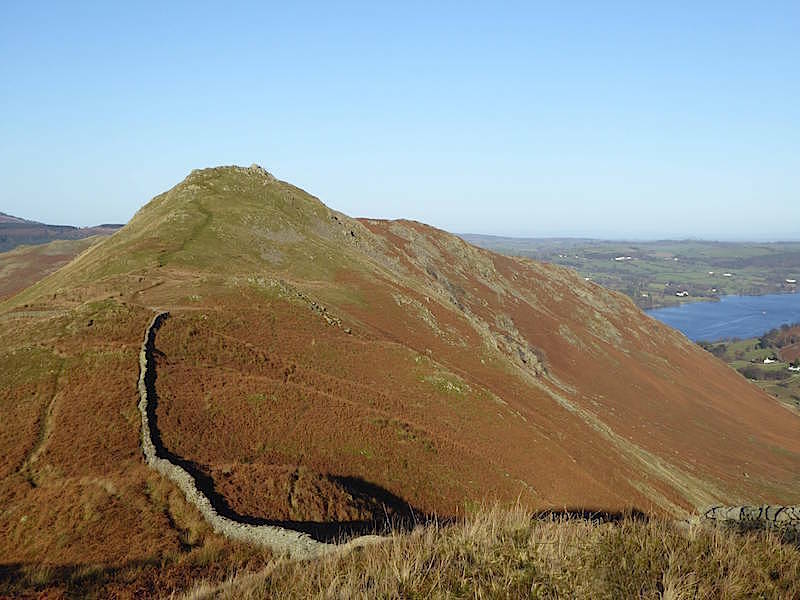 Hallin Fell and St Peter’s Church. 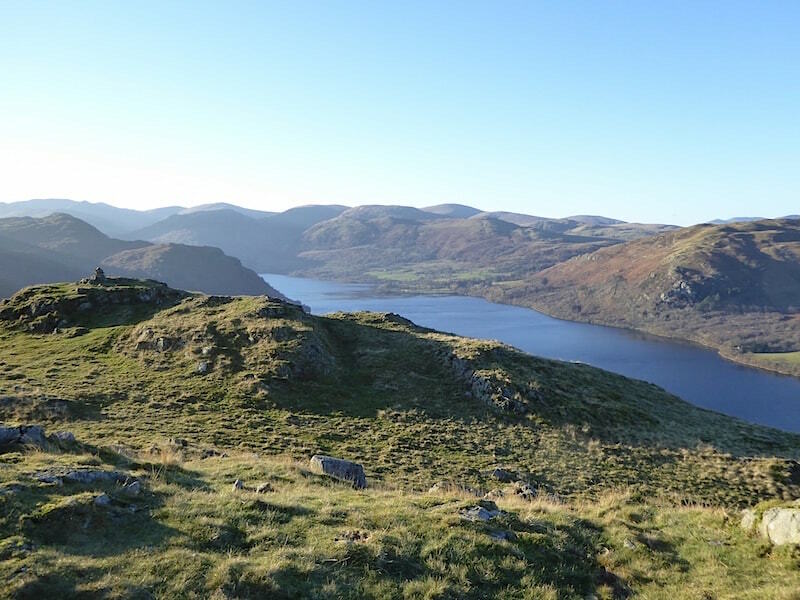 We made our way down to the church, offloaded the rucksacks and then set off for the short walk up Hallin Fell. 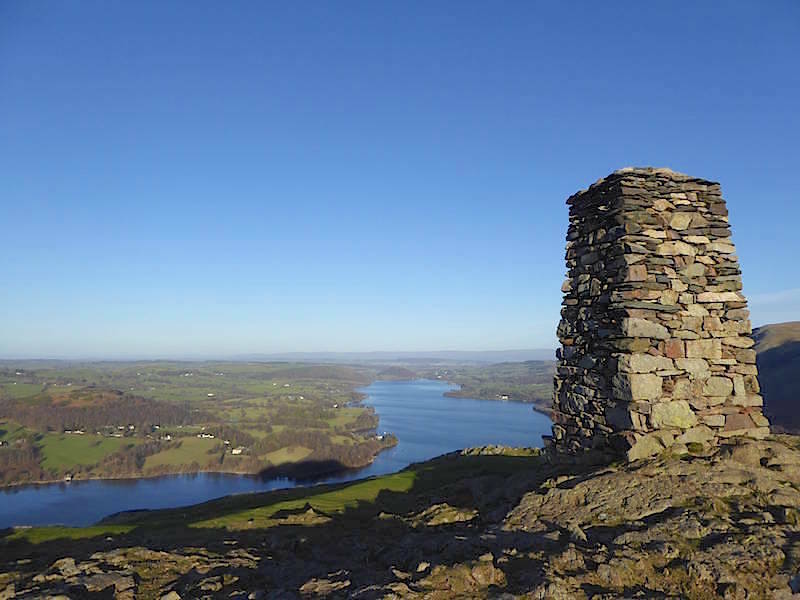 The summit tower on Hallin Fell, the top section has been missing for a number of years so its good to see that someone cared enough to put it back together again. 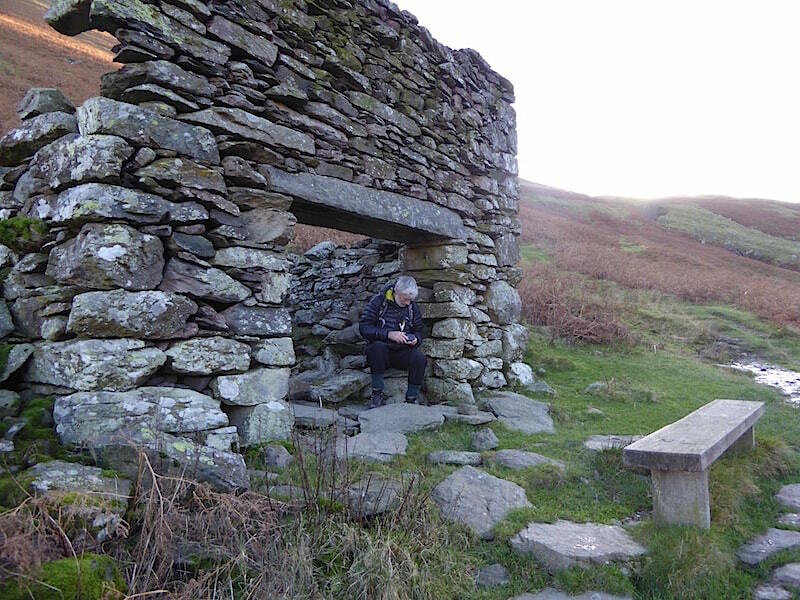 It provided a good sheltered spot against the chill wind too. 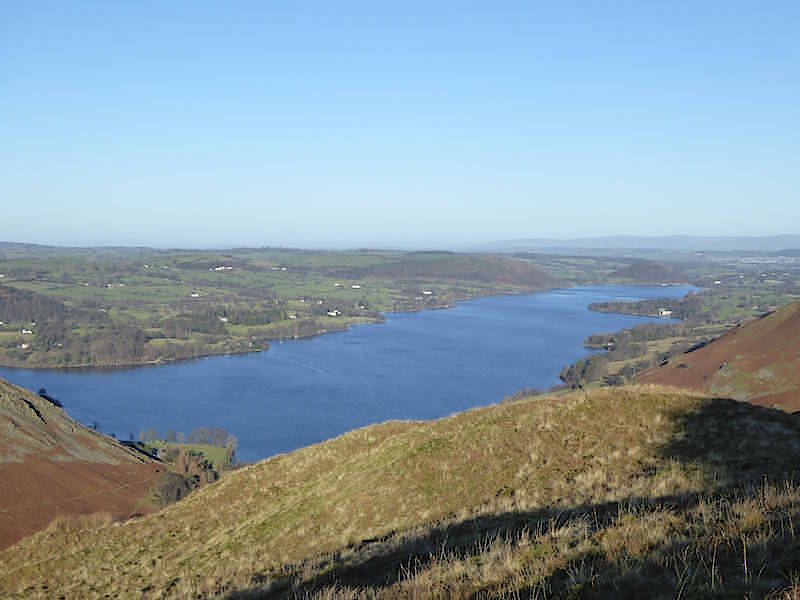 Looking north along Ullswater from Hallin Fell …..
….. and finally, a view along the southern end of Ullswater. 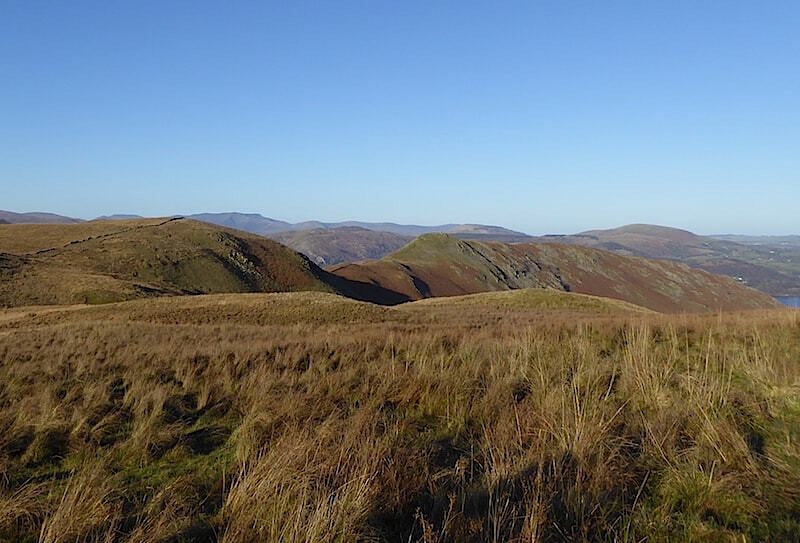 It was certainly a day of absolute peace and quiet without a doubt. 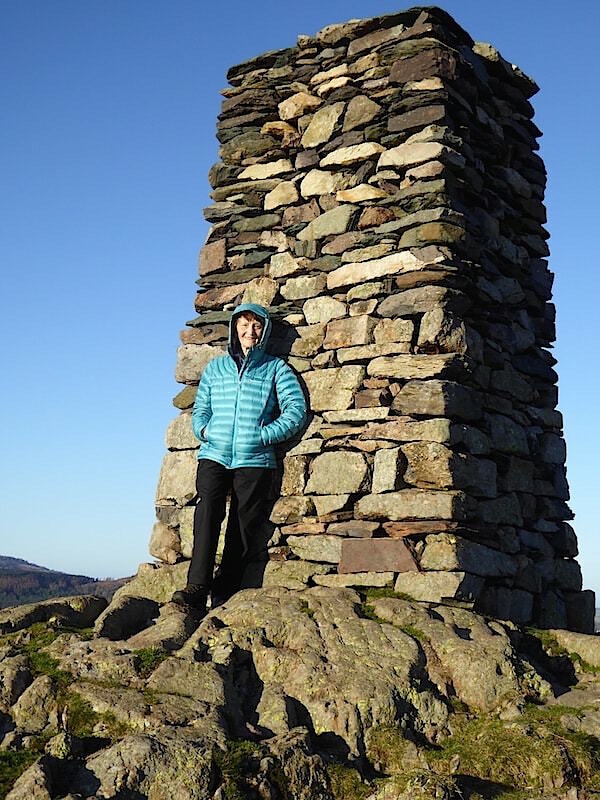 We met no-one on the walk up Fusedale although we did spot one lone walker over on Pikeawassa as we made our way up the valley, and on the walk up Hallin Fell we passed two walkers and their dog who were on their way down, and that was it. Not that I’m complaining but I did think that there would be more people about on such a glorious day.